One of the most popular and influential British artists of the twentieth century, David Hockney, returns to ‘Tate Britain’, Millbank, London, for his most comprehensive exhibition yet, in February 2017. 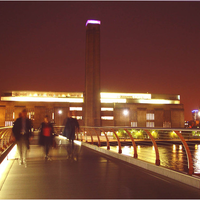 This Tate modern gallery exhibition gathers together an extensive selection of Hockney’s most famous works celebrating his achievements in painting, drawing, print, photography and video across six decades. As he approaches his 80th birthday, he continues to change his style and ways of working, embracing new technologies as he goes. From his portraits and images of Los Angeles swimming pools, through to his drawings and photography, Yorkshire landscapes and most recent paintings (some of which have never been seen before in public) this exhibition shows how the roots of each new direction lay in the work that came before. A once-in-a-lifetime chance to see these unforgettable famous painter’s works together in one place, from 9th February until 29th May, 2017. David Hockney was born in Bradford, Yorkshire on July 9, 1937. He attended the College of Art in Bradford from 1953 to 1957, and the Royal College of Art in London as of 1959, completing in 1962. David Hockney's early works displayed the artistic ways of expression, such as Abstract Expressionism, as seen in paintings by Jean Dubuffet and Art Brut. He soon became enveloped in Pop-Art, caring little about traditional styles and schools. He went to the U.S. in the early 1960’s, staying in California and New York, officially moving in 1966. He developed his art in the clear and cool use of forms and the integration of autobiographic details. It is at one of the visits to New York that he became friends with Andy Warhol. The swimming pools of L.A. were one of his favourite subjects, at this time. He became known for large, iconic works such as A Bigger Splash. His expressionistic style evolved, and by the 1970s, he was considered more of a realist. 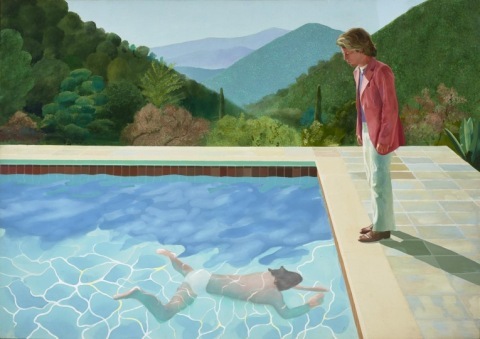 During the mid 1970s, David Hockney embarked upon stage design, working upon, "The Rake's Progress" by Strawinsky at the Glyndebourne Opera in 1975, and "The Magic Flute" by Mozart in 1978 for the same house. He also does several designs for the Metropolitan Opera in New York as of 1981, in 1983 for the Eye and Ear Theatre in New York. In the late 70s, he developed photo collages that he put together from numerous Polaroid shots. Each photo is a facet of the whole, so that the collage seems like an image in a cracked mirror. These works are acknowledged as Hockney's late examination of Picasso's works and Cubism. During the late 1980s, he also deals with new media, making multicolor copy prints and abstract computer prints. In the nineties, Hockney continued to experiment with new populist technologies. He used a colour laser copier in some of his works and reproduced some of his paintings. Hockney was impressed with the vibrancy of colour that could be achieved using such devices. He also began sending drawings to friends via fax machines and was thrilled with this new way of communication. Much of the appeal lay in the fact that these newly produced images had no financial value at all. Since 2009, Hockney has painted hundreds of portraits, still-lifes and landscapes using the Brushes iPhone and iPad application, often sending them to his friends. His show Fleurs fraîches (Fresh flowers) was held at La Fondation Pierre Bergé in Paris. A Fresh-Flowers exhibit opened in 2011 at the Royal Ontario Museum in Toronto, featuring more than 100 of his drawings on 25 iPads and 20 iPods. In September 2016 Hockney announced the issue of a new book David Hockney: A Bigger Book, costing £1,750 (£3,500 with an added loose print). The book, weighing almost 70lbs, had gone through 19 proof stages. He unveiled the book at the Frankfurt Book Fair where he was the keynote speaker at the opening press conference. Hockney's life and all his loves are always on display to the public. He has truly made art a form of real human interaction and communication. Brilliant Wall Art have a fabulous range of affordable wall art which mimics the trees and landscapes inherent in David Hockings ‘Yorkshire’ landscape phase of just over ten years ago. Please take a look at our inspirational wall art. The BWA 4 Seasons Tree Branch Set, shows stunning individual pieces to represent each season…Spring, Summer, Autumn and Winter. Each piece is easy to hang and each tree measures approximately 34cm (13.5") high by 34cm (13.5") wide. This reminds me when Ellie Harrison (of BBC ‘Countryfile’ fame) interviewed David Hockney about the ‘Wolds’ and discussing his painting of the ‘Tunnel’ near Bridlington in Yorkshire. He recorded the vista with 9 different cameras for each of the four seasons. An interesting perspective. We promise to be the most competitive online service and therefore the cheapest. Express the artistic side of your personality…visit Brilliant Wall Art.